I just read this very interesting little text on Paul Cézanne by Blake Gopnik. Cézanne is said to be a painter whose work laid the foundations of the transition from the 19th-century conception of artistic endeavor to a new and radically different world of art in the 20th century. It has to do with his experimentation with perspective, colors and surfaces. And also with his choices of subjects and scenes. There is an endless repetition in his work. As if he is never quite satisfied with his own painted results, or as if the motifs he was working on were inexhaustible. Or maybe he just tried to show us a glimpse of abundance – the worlds profuse richness. Glenn Gould called Bach the greatest architect of sound, I’m tempted to call Cézanne the greatest architect of color, of surface. The relationship on view at the Met is not between Paul and Hortense, at all, but between eyes, paintbrushes, palette and a pile of flesh and cloth. And you could say that the peculiarity of that modern non-intimacy–the fact that looking stopped being knowing­–is the real subject of Cézanne’s art. Weirdly, that too turns out to be full of emotion. Yes!! absolutely what you said, ” the greatest architect of color, of surface.” The intense act of looking so that structuring of surface becomes his reality makes his painting a new experience upon each visit. I have to admit, there is no other painter that makes me look at paintings as excitingly as his. 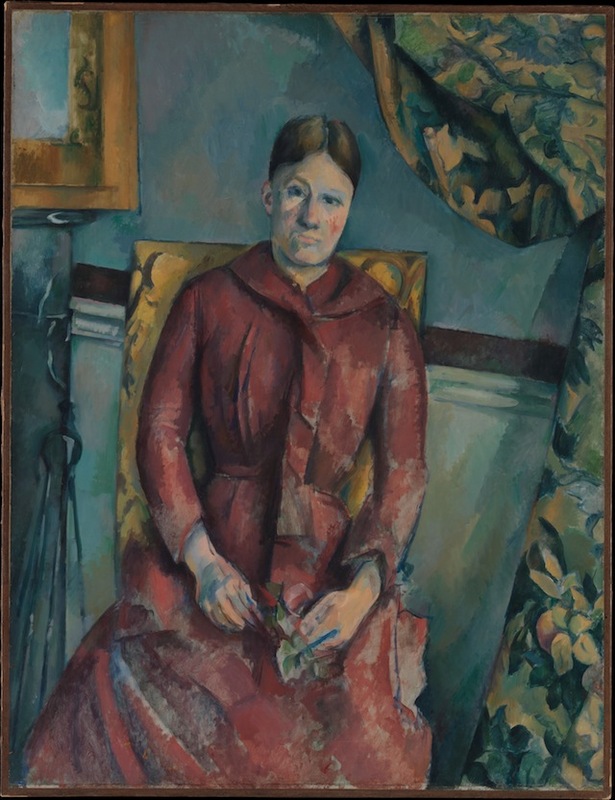 Quite recently I visited the Barnes Foundation collection in Philadelphia, and what I noticed there is that Cezanne’s paintings kept returning my attention. As if there are innumerable and continually exciting ways to paint apples, or pears, or a landscape, or a model. And there are, and somehow there is a kind of emotional intimacy that returns the viewer’s interest. So I think anyway. Thank you Ann! Do you think Cézanne has a special appeal for makers? That one somehow can identify with the process even if one work in a different medium? Don’t his little dabs that make up small blocks of colour show that he was, above all, interlocking shapes and colours in a way that’s so abstract as to question whether he was repeating his subject matter at all – if that subject matter is the paint itself? Absolutely, BUT; remember that he painted the same motifs over and over. In my opinion his process must also have been about the relation between art and world. When I worked in Rathbone Place in London, I used to often walk to the National Gallery during my lunchbreak. I recall hearing the sound of trees in the breeze while looking at his landscapes. His world seems so quiet. I suppose that depends upon the maker. I started out with art, and studied it before moving to writing. So I have some understanding (only a little, but some) of what the processes are…and how they may be alike.